We're not quite yet at the stage of having our "Jetsons-esque" chef prepare our meals for us - and for that matter, our robotic floor cleaners only go so far when we spill a bag of flour; however, Blum has come up with some very unique ways to simply get your cabinets to open: Touching them. Now before the cries of "how lazy can we get?" start up, there is a problem with certain kitchens that this type of ingress into your cabinetry solves. This problem his how to open your doors and drawers when you want the kitchen to be handle-less. The simpler solution is to install recessed channels between the fronts, but this reduces available space, and also takes away from a completely plain, flat look. Another solution is cutting in recessed handles into the fronts, but again we run into the problem of adding detail to a detail-less design. 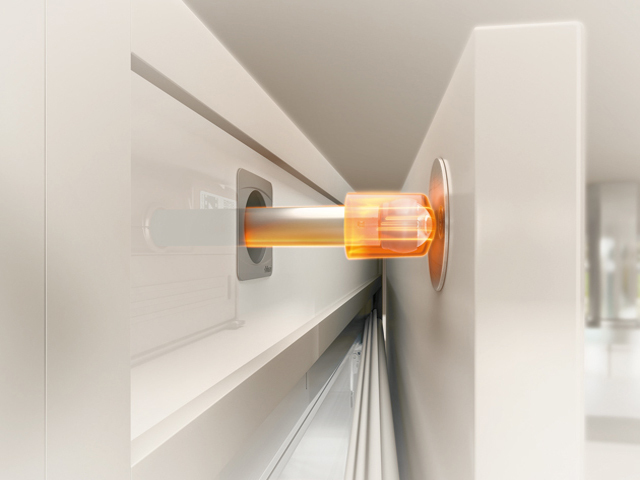 The Servo-drive system from Blum provides and electronic system of opening and closing your cabinet doors and drawers. Typically the regular upper cabinet doors can be opened from the underside with fingers alone, but some of the doors that tip up to open can be almost impossible to close if they're too high. Hence the 'touch to open/touch to close' motorized hinge system solves the problem (much better than a ladder does). For the drawers, there is a motorized lever at the back of the cabinet that pushes the drawer out when the fronts are touched. Now we have the cabinetry opening up, but the final hurdles in this design challenge are the appliances. How do you open a refrigerator or dishwasher without a handle or a routered channel to grab onto? 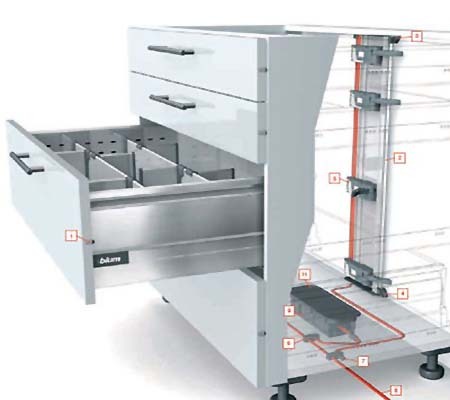 This is where Blum's new Servo-drive Flex system comes into play. Similar to the integrated automated 'knock-to-open' piston system recently introduced by Miele appliances, these Servo Flex pistons can be installed behind any appliance door that has a millwork panel installed on it. Simply touch the door and the appliance pops open! There's even a sensor in place that will only activate on a specific kind of touch and will not open if you're simply leaning on the fridge with wine in hand. So prepare yourself for the next incremental step in automating your kitchen. Ordering an omelette from your android can't be too far down the line. Interested in learning how to incorporate Servodrive technology into your design? Come down to the showroom and we can help out.